Retailers went back to work after the holiday, buying into an "as-is" economy. As merchants reported their full 2010 numbers, they forecast that 2011 will be a year spent dealing with inflation, expanding stores and trying to wean shoppers off their markdown habit, rather than cutting costs and inventories and reacting to crises as they did for the last two years. Faced with rising material costs that are pushing prices higher, merchants say they have to focus on growing sales in 2011, regardless of the economic pressures. "We're prepared to operate effectively in a slow-growth environment," said Robert Niblock, CEO of Lowe's (LOW). The hardware chain reported earnings for fiscal year 2010 rose 12.7% to $2 billion and comparable sales (for stores open at least a year) rose 1.3%. Rival Home Depot (HD), which reported even better results, is also in "new normal" mode. It posted earnings of $3.34 billion for 2010, up 25.4% despite the weak housing and employment markets. It also announced it expects to repurchase about $2.5 billion worth of shares during 2011. CFO Carol Tome noted the hardware chain will work around housing and employment pressures that don't look likely to let up. The 2010 numbers -- which included rising sales in 49 out of 50 states -- showed business can improve even as the housing market remains under stress, with housing remaining at historic lows as a percentage of GDP, she said. "The overall picture of one of a stabilizing business," Tome said. Most retailers reported strong holiday seasons that helped push 2010 to a profitable close, and many announced share repurchases, debt repayment and expansion plans for 2011. Macy's (M), which posted its best comparable sales increase in 15 years, said it plans to use its free cash this year to retire more debt on top of the $1.2 billion it paid off in 2010 in an effort to pull its debt back to investment grade. ""Obviously there's a lot of competition there, but we feel very good about 2011," said CFO Karen Hoguet. Macy's is among several retailers who said they plan to step up store remodeling programs in 2011. Target (TGT), which already revamped a large fraction of its stores in 2010 to add larger grocery sections, said it will continue that program in 2011. The discounter, which struggled with sales growth in 2010, posted a 21.4% increase in earnings for the year and comparable sales growth of 2.1%. 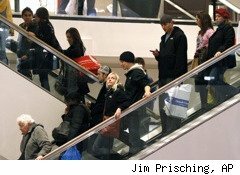 Many of the lower-end retailers noted sales growth is still proving a tough effort, and is expected to stay that way in 2011. "The U.S. market for the kinds of goods we sell is not enjoying robust growth," said Target CFO Doug Scovanner. Without mentioning Walmart Stores (WMT) by name, he referred to the results the giant discount chain reported earlier in the week: Walmart's earnings rose 12% in 2010 during the year, but its U.S. comparable sales dropped 0.7%. "A lot of people are picking on my big brother, but it's more of a reflection of what's happening in the economy," said Scovanner. Shoppers are coming back to stores, but they're still holding back on spending, said Kathy Tesija, Target's executive VP of merchandising. She noted shoppers are increasingly finding ways to cut back their spending on everyday items buy using coupons, buying store brands and waiting for sales to pay for their splurges on other items. Since the holidays, Target has noted many shoppers have traded down to the "good" items in some categories such as housewares, while trading up to "better" and "best" price ranges in other categories, such as apparel, she explained. That's going to be a problem as the retailers face the worst inflationary environment since well before the recession. Energy prices, labor costs in Asian manufacturing markets, and the price of commodities from cotton to copper are all on the rise, and vendors have stepped up their calls for price increases on items from clothing to housewares. "For the first time, in a decade or more, we're seeing some inflation that is quite high," said Glenn Murphy, CEO of Gap Inc. (GPS), which posted 19% increase in earnings, despite only growing comparable sales by 1%. Costs are expected to be up significantly, about 10% to 15% overall across all product categories, said Kevin Mansell, CEO of Kohl's (KSS). Product costs are already up by low single-digit percentages and that will "accelerate dramatically" this fall, he said. Kohl's is right to worry, because it had been doing well growing sales among moderate-income consumers: It posted net income of $1.1 billion in 2011, up 14% from 2009, and comparable sales growth of 4.4%. Management also announced the first cash dividend in the company's history, and increased share repurchase plans by $2.6 billion, to $3.5 billion by the end of 2013. But the expected price increases are putting pressure on retailers' plans for the second half of 2011. Most retailers said they had worked around the cost pressures to stock up for spring, but vendors have stepped up their requests for price increases during the last two months, which will increase retail prices in the second half of the year, whether shoppers like it or not. "We fully recognize when you're taking the prices up... we recognize that units come down, so we're planning accordingly," said Kristin Hays, investor relations manager of J.C. Penney (JCP). Penney, which had struggled through the year to build up sales, reported comparable sales rose 2.5% in 2010, and earnings grew 55% to $389 million. The department store chain has tested price increases in some areas to develop plans to pass on the cost increases. While Hays wouldn't give details, she noted the test results showed that higher prices in the "better" and "best" ranges made up for the lost sales in the "good" entry points. So shoppers should be prepared to face higher prices, especially for the finer things. The merchants say they are managing on a real-time basis to balance both price-hike requests from vendors and push-back from customers. "I think that's the question of the day. We know that we have to counter cost increases, the question is how much," said Mike Jeffries, CEO of Abercrombie & Fitch (ANF). The teen retailer turned things around during the holiday: It grew comparable sales by 7% in 2010 and posted net income of $150.3 million compared to net income of $300,000 in 2009. "We're grappling with this," said Jeffries. "We have bought our back-to-school assortment, [but] we're still negotiating for Labor Day and on." Figuring out what prices the traffic will bear will consume merchants' attention as they head into the key Easter selling season in April, and will really hit home during the second-largest shopping season of the year, the back-to-school period. "The point of this tension is it has to be managed on a week-by-week basis," said Jeffries. "Those who can't have big problems."